For years I have been wanting to try seafood paella but there seemed to be too many variables that kept me from making it....namely a paella pan. I know that there are typically other pans that can be used but for traditional paella I really felt like I wouldn't do it justice if I tried it in even my beloved cast-ironed skillet! I know that seems like crazy talk coming from me as I tend to covet other's cast ironed skillets, even going so far as to run my fingers across old skillets I see in yard sales and at the flea market just to feel that smooth, well-used, most-loved surface. But seriously, I felt like I really needed an actual paella pan to make this dish. Finally one showed up in my kitchen! It wasn't some gift sent from the magical kitchen gods, but it was pretty close. My roommates mother has access to some pretty amazing cooking equipment and gets some for her daughter whenever it seems like something Lauren would like. Well this sealed the deal! Since Lauren likes to cook but doesn't do it all that often I asked if I could take on the task of seasoning the new pan (according to the instructions that came with it) and using it while on vacation with my family to make seafood paella.....finally my wish was coming true!!! The seasoning took no time at all, though I really had no idea that you could season a steel skillet, but you can, and I did! Off to the beach where we would have a plethora of fresh seafood at our disposal! 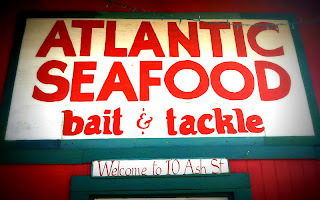 My favorite place to go when we get to Amelia Island is a local little seafood store right on the water in Fernandina Beach called Atlantic Seafood. 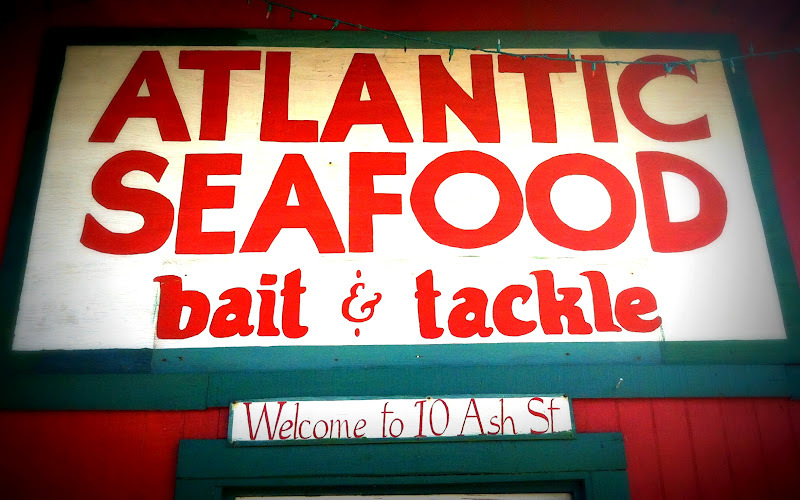 How can you go wrong buying seafood that literally came off the boat THAT DAY?!?!?! Rub the spice mix all over the chicken and marinate chicken for 1 hour in the refrigerator. Heat oil in a paella pan over medium-high heat (I did this on the grill because I think it cooks better that way but if you don't have access to a grill or don't have something that will work on a grill you can also do this over the stove). Saute the sausage until browned, remove and reserve. Add chicken and brown on all sides, turning with tongs. Add salt and freshly ground pepper. Remove from pan and reserve. In the same pan, make a sofrito by sauteing the peppers, onions, garlic, and parsley. Cook for 2 or 3 minutes on a medium heat. Then, add tomatoes and cook until the mixture caramelizes a bit and the flavors meld. Fold in the rice and stir-fry to coat the grains. Pour in water and simmer for 10 minutes, gently moving the pan around so the rice cooks evenly and absorbs the liquid. Add chicken, chorizo, and saffron. Add the clams and shrimp, tucking them into the rice. The shrimp will take about 8 minutes to cook. Give the paella a good shake and let it simmer, without stirring, until the rice is al dente, for about 15 minutes. During the last 5 minutes of cooking, when the rice is filling the pan, add the lobster tails. When the paella is cooked and the rice looks fluffy and moist, turn the heat up for 40 seconds until you can smell the rice toast at the bottom, then it's perfect. Cook's note: The ideal paella has a toasted rice bottom called socarrat. I purchased the saffron in a much smaller quantity than they sell at the grocery store at Whole Market. I was able to buy about a tablespoon of saffron for $4.99 instead of a larger container for $15 at the grocery. If you use it often then purchase the big one but since I don't I didn't want to spend that much on one thing of a spice I didn't need. I also found the kind of paprika at World Market but I know that you can find that at some grocery stores and William-Sonoma. The recipes I saw also called for mussels, scallops, and lobster tails but since I only bought what was fresh and not frozen I only used shrimp and clams but also added chicken and andouille sausage to make up the difference.